Grant Archer merely wanted to study astrophysics, to work quietly as an astronomer on the far side of the Moon. But the forces of the "New Morality", the coalition of censorious do-gooders who run 21st-century America, have other plans for him. To his distress, Grant is torn from his young bride and sent to a research station in orbit around Jupiter, charged with the task of spying on the scientists who work there. What they don't know is that his loyalty to science may be greater than his loyalty to "The New Morality". But that loyalty will be tested in a mission as dangerous as any ever undertaken. I really enjoyed this book, great SF, i.e. the science is credible, but eerily futuristic and captivating, really makes you wonder... The story line is great, Bova is just a great story teller; the story is an adventure with lots of action etc, but it is also about the inner life, struggles and journey of discovery of its main character. Finally, the character development is excellent, you really get to feel some of the struggles and emotions of the characters. A great read that I would highly reccomend! I loved this audio. 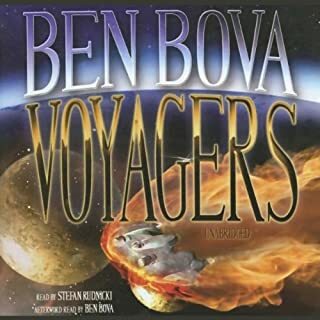 Having heard all of the Voyager series I quickly became a Ben Bova fan. This audio is even better than Voyagers in my opinion. It was truly riveting in storyline, charaterizationa and suspense that glued me to my ipod until the end. I hope Grant Archer will be repeated in a sequel to this. I have been a reader of science fiction for many years but only recently began listening to audio books. Jupiter was my first audio SiFi and I couldn't be happier with the whole experience. Bova's story is a classic SiFi with a riviting story line, good science, interesting characters, and an underlying politic theme. The great story is made even better with the wonderful oral presentation. I began listening to the story in car while traveling to work and appointments. The story was so captivating, I was soon wearing the ear buds from the car into the office and home. Then it was any lame excuse I could make...in the bathroom at times. I have just downloaded Titan and hope for more of the same. There were a few technical details I thought overlooked by Bova, like the characters could talk while submerged in a PFC liquid. The fluid would have slowed the vocal cords too much to allow speech. Also, the characters are "connected" to the ship with fiber optic lines attached to their legs. This system of connectivity would be very cumbersome and in fact was in the story. Yet the PDA-type devices apparently connected to the ship by some other wireless system not explained in detail. Obviously, a wireless system would be far more likely in this situation. But despite such little details, Bova does a wonderful job imagining the possibilities of the Jovian atmosphere and all that lies within. 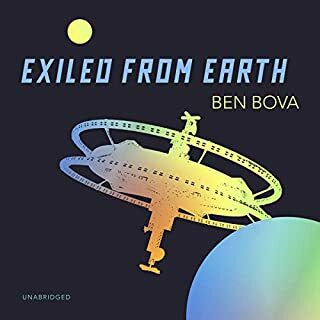 Like any SF junkie, I've heard of Ben Bova for a very long time. Unfortunately I've never got around to reading/listening to his stories, till now. I picked Jupiter for one my membership books and didn't know what to expect. Well, I'm glad I picked it, because this is great SF! A captivating story and interesting ideas. For those who didn't finish it and didn't like it, you really should've read till the end because I stayed up for 3 hours straight to finish it. For me, It got really good at the end. Although I still felt there were certain things that I felt were dropped just to make the ending a little more safe. I wish it were daring, and maybe it's just that it led me down this path thinking something were going to happen. It's fine though, I still enjoyed it. If you're a sucker like me for sci-fi and have a good chunk of free time, I would recommend it. 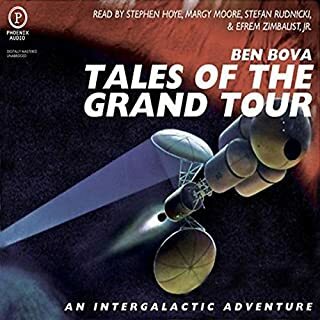 The Ben Bova's Grand Tour is real fun and approaches hard science fiction at times but remains a set of GREAT adventure stories first and foremost. Jupiter is an interesting view of the society that is in the books. This time it is from the view of a "believer" not the semi-atheists the other books tend to focus on. A real fun romp below the atmospheric oceans and a great "first contact" story. 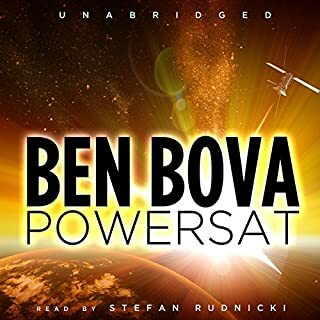 I was not particularly fond of Bova's earlier short works, I think I got interested in his (paper) books about the time the Rock Rat series came out, but I took a chance on Jupiter (audio) due to the reviews, and got HOOKED. I found myself in the truck going places I didn't really need to go just to listen to it, and then found myself walking around with my MP3 player in my pocket. It Lead me on to "Titan", (I JUST finished it) which is also an excellent book, and I am hoping Bova will continue the series. Pack your swimsuit and your imagination for this! What did you like best about Jupiter? What did you like least? Some of the interpersonal issues ( which Bova seems to take special pride in ) can detract from the core story, but are tolerable. On the flip side, the internal dialogues of the Leviathans are fascinating, esp. given the reading by the inimitable David Warner. What was one of the most memorable moments of Jupiter? As in most of Bova's stories, they kind of flow ( versus have high points/low points ) so looking for a specific moment may not be helpful. That said, I did like the "resolution" per se. Which character – as performed by Christian Noble and David Warner – was your favorite? The Leviathans by Mr. Warner are highly compelling. Could you see Jupiter being made into a movie or a TV series? Who should the stars be? Gosh, I am not a casting agent. A big story to be told , that is for sure. The Solar System series continues to fascinate and grow on me. This one is notable in that it is not narrated by Stefan R. and so we have a fresh view on Bova's storytelling. 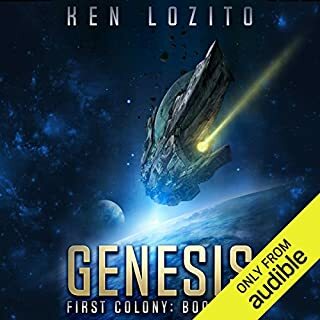 On balance this is a very entertaining audio performance, is a good stand alone story ( as opposed to be a continuance of previous stories ) and is well worth the credit for fans of this series, and for any true speculative fiction fans. It started slowly and there were dragging moments BUT the whole story was entertaining and enjoyable. This recurring theme of the Christian leaders taking over the world is getting tiresome though what with Ben Bova and Allen Steele both pushing it. Talking Gorilla? Couldn’t get past it. This book really had promise and maybe I gave up too soon. But halfway through the story, the talking gorilla on the space station wrecked it for me. I don’t mind investing in the first three or four chapters for character development and this was done quite well. But finding myself halfway through the book Sitting through long dialogue between a talking gorilla with the IQ of a two-year-old child and the main protagonistand there was absolutely no hook. A good read, although not perfect! This book is a good read althougth the characterisation leaves a little to be desired! The plot is very interesting, the science seems plausible and firmly grounded in reality. There are a lot of political and religious intrigues that reflect current real life issues and certainly give one plenty to think about. My main problem with this book is the characterisation, it seems fairly two dimensional. The reader is more or less clued in to the nature of each character from that characters first line of dialogue. Also the level of hostility between members of the scientific community on the Jupiter orbital station seems to be at such a level that it would make it virtually impossible for that station to operate in any reasonable way. Other than my concerns over the charcterisation and interaction between some of the characters, I really enjoyed this book. In some ways it felt like classic style SF but with modern overtones and issues. I have just bought another BOVA, so I guess it was good enough to get me to read another one. 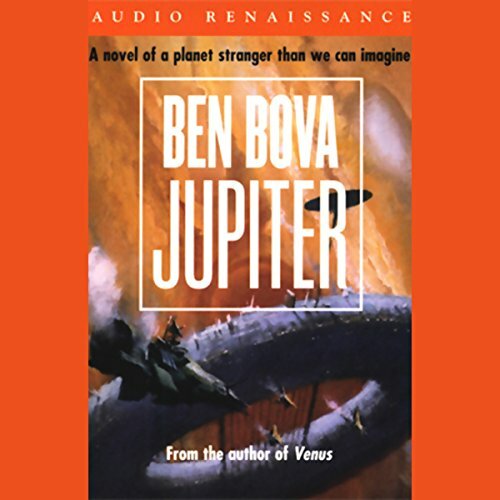 Jupiter was my fifth Ben Bova novel from his Grand Tour series and I liked it. The two moon based stories I've read, Moon Rise and Moon War didn't really impress or grab me like this story had. I think one of the reasons why Jupiter was a better read for me was the more interesting characters. There is a decent and diverse group of people in this story and it does seem that Bova is either a hit or miss author in respect of getting his characters right. The two Mars based stories I've read so far Mars and Return to mars were in a similar vein to this book in terms of a more enjoyable set of characters generally speaking. The main protagonist, Grant Archer starts off as a green and inexperienced young scientist sent off to the research station orbiting Jupiter as part of his mandatory 4 year public service duty. Grant is introduced to the station and meets new people and makes friends along the way. The characters are written well and have distinct traits and personalities which lifts the story and pulls the reader into Grant's new world as he struggles to find his feet in his new environment. Of course, things are not made easy for him and the station director is a stern and austere character that makes life difficult for Grant as he tries to fit in. However, Bova lets the reader gradually see and appreciate a different side to the hard edged director as the story progresses which I liked and pleased me as initially I thought this character to be a one dimensional portrayal of a tough leader. Bova paints a picture of station life and the people in it that draws the reader into their story and allows us to tag along with Grant on his journey. I think the attribute I liked best about the Grant Archer character was that he was written as an ordinary person with apprehensions, fears and weaknesses and not one of those sorts of characters who are always self assured and know the right answer to everything. Grant is finding his way in his new world and so are we along with him as the reader. I found the plot uncomplicated and well paced and there is a spy for the New Morality on the station and the author often misdirects us as to who this culprit might be. This brings me to perhaps one of the biggest issues I have with these Bova stories as many of them feature the "New Morality" which is a political and religious bunch of zealots that control the government and have authority over many aspects of life. I didn't like it when Earth bound politics start encroaching upon his stories and I just find the whole scene dull and a distraction from what I think of as the real science-fiction story. In addition, I find it very silly that a future enlightened world would seek to take steps backward into the middle ages with it's religious dogma and policies that stifle things like the quest for scientific knowledge as it might upset the view that God created us and that no other intelligent alien life must be found. For me, the entire New Morality sub-plot is ridiculous and out of place in a society which supposedly has moved on in its understanding of the universe. I was surprised that the New Morality didn't start issuing new dictates rewriting science by stating that the Sun moves around the Earth and the Earth itself is flat and only 4,000 years old. Anyway, Bova didn't thankfully include much from this group in the story and I believe there are other Bova stories within his Grand Tour series that heavily focus on these religious groups and this is why I have avoided those titles. The concepts Bova puts forth in this and other Jupiter related stories is an interesting one which posits an ocean beneath the cloud layers that supports various life forms as well as life in the cloud layers itself. I can't remember if Jupiter actually has any ocean of any kind other than dense gas down to its core and if this is so I am surprised Bova took this approach as I believe he has a beat on current scientific theories and is supposed to be quite scientific in this writing of such things. I can't say but all the same I did like the vision of Jupiter he describes. Grant and his new friends are sent down into the Jovian ocean to make contact with the leviathans that dwell in the vast deep. In order to do this each crew member has to effectively drown in the same liquid seen in the movie "The Abyss" and I wonder if Bova got this idea from that movie. The thoughts of the leviathan are narrated by a different speaker who is excellent and has the right voice to lend awe and gravitas to the narrative of these immense creatures. A quirk I find of Bova's writing is that he seems to separate chapters in some of his books with quotes from famous people or in the case of Jupiter, psalms. I find this a little incongruous in that Bova appears to try lending weight and a sense of majesty into a story that is more of a pulp science fiction story than one where such weighty prose fit. This brings me to say that another reviewer stated that Bova's stories are not pulp science fiction and are hard science-fiction. I would have to disagree with that assessment. This is not to belittle Bova's work - not at all. 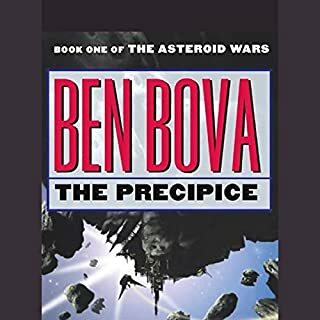 But judging by the five novels so far read from Ben Bova, I would have to say that his stories are far closer to pulp or "light" science-fiction that is generally more average reader friendly than some of the other authors I've read which make Bova's novels look like 1960's Star Trek. As ever in Bova's stories, a man cannot live amongst women without thinking of jumping into bed with them and I find this a basic flaw in Bova's style and hence my liking many elements of his stories to classic Trek. Overall though, I enjoyed Jupiter and the conclusion of the story left me wanting more. I subsequently found the follow-up story set some 20 years later called "Leviathans of Jupiter" which I've just read and will review soon. If you could sum up Jupiter in three words, what would they be? What does Christian Noble and David Warner bring to the story that you wouldn’t experience if you had only read the book? They make me hear it, not read it. This story is one of the best in the series. Total imagination, yet presented in a very believable way. This is a story about someone caught up in the convention and regulation of life who breaks free from the restrictions to performing original, ground breaking work. He is helped by a mentor who appears aggressive at the beginning. However, as time goes by he understands his mentor who isn't aggresive but more determined, even single minded at times, and shows him how to achieve a breakthrough in the understand of life, even though this goes against the convention and restrictions of the 'world' in which they live. As the title suggests, the story is based near the planet Jupiter. It is a good science fiction story, but also has this element of challenging the rules and regulations 'for the benefit of all.' I wont say any more about the detail of the story as I might spoil it for you. However, I thoroughly recommend this book.